Multipotent stromal cells, also known as mesenchymal stem cells (MSCs), possess great potential to generate a wide range of cell types including endothelial cells, smooth muscle cells, bone, cartilage, and lipid cells. 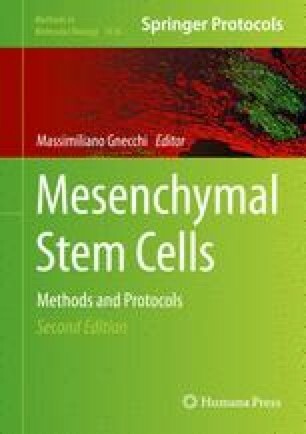 This protocol describes in detail how to perform highly efficient, lineage-specific differentiation of human-induced pluripotent stem cells (iPSCs) with an MSCs fate. The approach uses a clinically compliant protocol with chemically defined media, feeder-free conditions, and a CD105 positive and CD24 negative selection to achieve a single cell-based MSCs derivation from differentiating human pluripotent cells in approximately 20 days. Cells generated with this protocol express typical MSCs surface markers and undergo adipogenesis, osteogenesis, and chondrogenesis similar to adult bone marrow-derived MSCs (BM-MSCs). Nonetheless, compared with adult BM-MSCs, iPSC-MSCs display a higher proliferative capacity, up to 120 passages, without obvious loss of self-renewal potential and constitutively express MSCs surface antigens. MSCs generated with this protocol have numerous applications, including expansion to large scale cell numbers for tissue engineering and the development of cellular therapeutics. This approach has been used to rescue limb ischemia, allergic disorders, and cigarette smoke-induced lung damage and to model mesenchymal and vascular disorders of Hutchinson-Gilford progeria syndrome (HGPS). This work was supported by HKU Small Project Funding (201409126251 to Dr Lian Q); National Natural Science Foudation of China (No 31270967, 31571407 to Q Lian); Shenzhen Technology project (No JCYJ20140828163633995 to Q Lian); Science and Technology Foundation of Guangdong of China (No 2015B020225001 to Q Lian); Hong Kong Research Grant Council General Research Fund (HKU772510M to Dr Lian Q) and Innovation and Technology Support Programme (ITS/150/12 to Dr Lian Q).